BENDS: CURVED; CONTOURED; 2 BEND; 4 BEND are descriptions of tanning bed acrylics to more accurately illustrate the shape of the molded plastic. As the photo here illustrates, if your bed has one gentle bend and looks like the inside of a large, round pipe, then it is "curved" upward. If your shield curves down over the front of the bed, it is said to be "contoured". Finally, if your bed has side tanners and is 4+ feet wide, then it most likely will have a "2 bend" or "4 bend" acrylic like those pictured here. MASKING: The masking of an indoor acrylic is designed by the manufacturer to block the user's view of internal components of the beds because the tanning lamps do not cover all the surface area. 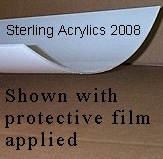 Please do not confuse masking with the protective film we ship our replacement acrylics with. When you receive your replacement shield, please inspect the plastic film for scratches and damage and DO NOT peel off this film if damage is present. Please refer to our shipping and returns policy here. When ordering tan acrylics, please note how many facial lamps your bed has and what the masking pattern is. Remember, masking is permanent and the protective shipping film should be removed once the visual inspection is complete. Pictured here is a two bend acrylic with protective shipping film still attached. Please inspect for damage and scratches before removing. Be careful not to remove any masking, if present. THICKNESS: Indoor tanning acrylics are manufactured or molded from a single blank sheet which may have a certain "thickness" which is described in "mils". The thickness of tan acrylics ranges from .125 mils thick for a 24 lamp home model and up to .312 mils thick for level 4 super beds which measure 4 feet or more across. When shopping for acrylics, a great question to ask is how thick the replacement is. FROSTED: You may also own a "frosted" acrylic that is NOT a clear, plastic shield but appears to be cloudy. Please specify this fact when ordering as it will affect the cost. Frosted acrylics are more expensive than clear shields and reduce the lamps effectiveness by 10% while the advantages of a frosted acrylic is it provides a more diffused light. ACRYLIC CLEANERS: Indoor tanning acrylics will become scratched from users getting in and out of the bed or scraping against the sides. The acrylics should be cleaned and sanitized after each use with approved products which kill all germs and microscopic bad guys. The cracks and scratches are the most dangerous because they harbor these bad germs and allow them to breed there. There are products on the market, like those pictured here, which remove scratches from tanning bed acrylics and other types of plastic shields. The NOVUS brands offer a 1, 2, 3 step product approach which includes a deep scratch remover, fine scratch remover and polish. We strongly recommend all these cleaning and sanitizing products to properly maintain your replacement acrylics.